Back when you were a wee one, there was no such thing as anti-aliasing. People were also unaware of what ‘tessellation’ or ‘bump mapping’ was, along with many other things that make modern day games look not-like-PlayStation-games. If you pine for a simpler time, then Back in 1995 is for you. If you like your games suitably retro, we’ve got a great selection to try in the best indie games on PC. A survival horror destined to hit Steam on April 28, Back in 1995 recreates the year of its namesake in every way possible. 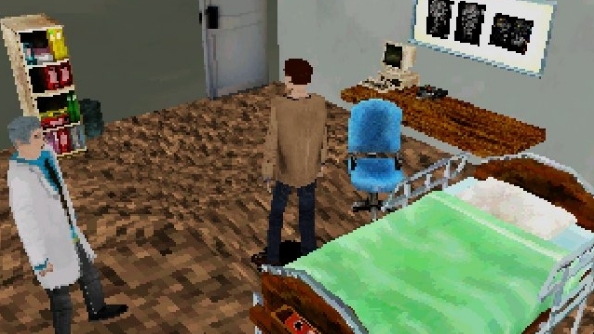 Most obviously, it looks like a 1995 game: jagged edges a-plenty, textures stretched like taffy, and fewer polygons than potato slices in a bag of chips. The frame rate is near non-existent, and the whole thing plays a 4:3 ratio with scan lines like an old CRT screen. Then there’s the way it plays. As a homage to the era, you can expect big full-screen inventories, sluggish controls, and awkward cut scenes. The story and mechanics seem to pull much from Silent Hill, which has continued to endure as one of the best survival horror games despite its age. Back in 1995 has been created by indie developer Takaaki Ichijo, “as a means to replicate the unique feeling he had from his first gaming experiences: the PlayStation and the Sega Saturn”. That feeling is certainly captured in how it looks, but we’ll have to wait until release to see if it really feels like the 90s. Is the novelty of revisiting the distant gaming past enough to get you interested in Back in 1995, or have thing progressed for a good reason?